We have great pleasure in presenting to scholars and devout readers V of the Rgveda the Fourth Reprint of the First Volume of the Rgveda along with the celebrated commentary of the great Acarya Sayana. The Rgveda is the oldest and the most important of all the works of Vedic literature. The second and the third editions of this volume were printed in years 1972 and 1980 respectively. At the time of printing the second edition a few necessary foot-notes were added and the printing errors in the first edition were all duly rectified. The present fourth edition is in a way a mere reprint of this second corrected edition. We take this opportunity to acknowledge the substantial financial help, the Mandala received from Prof. Shankar Yadav Ponkshe Trust founded by his kind and pious wife, the late Smt. 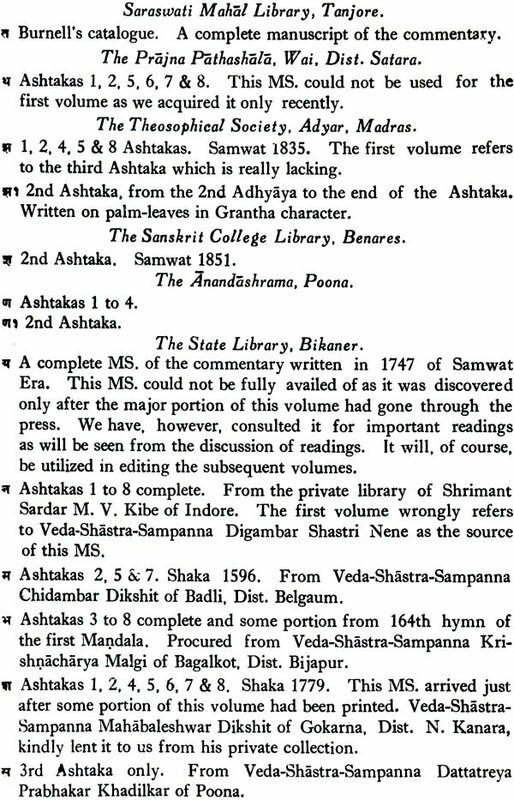 Sumatibai Shankar Ponkshe with a view to helping studies in Vedic texts and Religion. We must not forget the services rendered by Shri. S. P. Barve, propritor, Parashuram Process, Pune 411 005, who made the printing of this volume as speedily and as accurate as possible. We trust that the edition will prove to be of great use to Vedic Scholars. We have great pleasure in presenting to students and devout admirers of Ancient Indian Culture, the First volume of the Rgveda which contains the First Mandal and the commentary of Sayanacharya thereon. (1) To provide Facilities f or higher studies in Vedic literature. (2) To collect books and Mss. concerning Vedic literature. (3) To publish original Vedic Texts with commentaries. (4) To publish such other literature as would help the study of Vedic literature, e. g. indices, Lexicons, Notes, Original contributions etc. (5) To carry on research in general. An authoritative edition of Rgveda with Sayana’s commentary has been a desideratum for a number of years. Prof. Max Muller’s edition is out of print as also the Bombay edition. It is a truism to say that a copy of Rgveda with Sayana’s commentary is essential for the study of Vedic literature; for Vedic studies must begin with Rgveda which is the source and Foundation el: all the other Samhitas, Brahmanas etc. To remove the long-felt want of a reliable edition we had to do the preliminary work necessary for the publication of this Volume. This second volume of the Rgveda-Samhita had gone out tint since long and was a long-felt desideratum for the scholars also for the students of the Vedas. This is an up-dated and re-set impression of the third edition. We gratefully acknowledge our indebtedness to the authorities of the Pro! Shankar Yadav Ponkshe Public Trust, Pune and Mr. Mohan Rajaram Anturkar for their generous donations of Rs. 1, 05,000/- and Rs. 10,000/- respectively, without which this project could not have been completed. Our sincere thanks are also due to numerous other donors, who contributed to this project. Finally it is our pleasure to express our thanks to the Services, Pune for their neat and quick printing. We hope, this volume will meet the approval of the scholars. We have great pleasure in presenting to the scholars of Oriental lores and admirers of Ancient Indian Culture, the Second Edition of the Rgveda Sãyanabhasya Vol.III, critically edited and published by the Mandala in 1941 and which had gone out of print since long. The misprints which had stealthily crept in the first edition of this volume have been duly rectified in this edition. We have tried our best to bring this volume as accurate as possible. It is gratifying to note that we have received an appreciable financial assistance from the Ministry of Education and Social Welfare; Government of India as well as from the State Government of Maharashtra. But for the financial aid received from both the Governments, the publication of this volume might not have materialised. We record here our deep sense of gratitude to both the Governments for their generous and timely help. Similarly Shriman N.S. Parkhe of the Central Pulp Ltd., Fort Songad, relieved us from the anxiety of paucity of paper, by specially manufacturing the adequate quantity of - durable printing paper required for this volume and we feel grateful to him for the same. 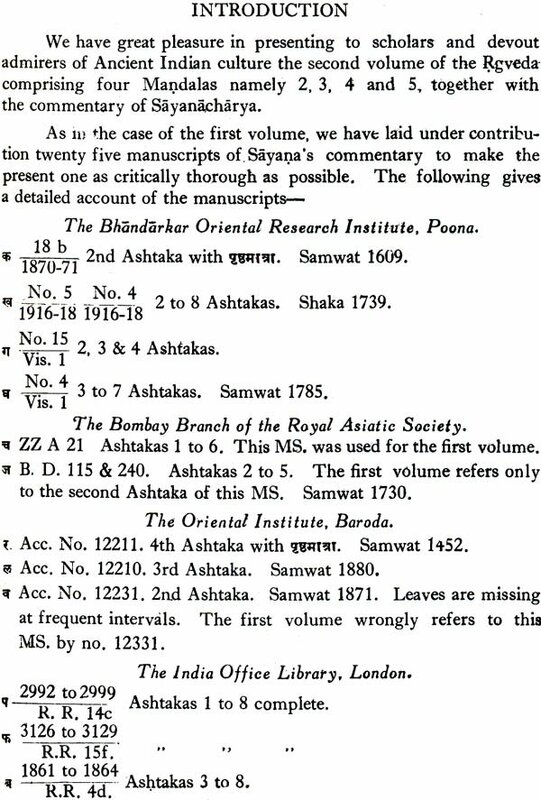 The printing of this volume was carried out by Shri S.P. Barve of the Parashuram Process, Poona 5, and we thank him very much for the great vigilance and care he applied to the printing of this volume. We must also thank our colleague Dr. S.L. Athalekar, who helped us a lot in minutely going through this volume to bring it as faultless as possible. We hope, this volume will prove a great help to scholars, oriental as well as occidental. We have great pleasure in presenting to the Scholars of Oriental lores and admirers of Ancient Indian Culture, the Second Edition of the Rgveda Sayanabhasya Vol. IV, critically edited and published by the Mandala in 1946 and which had gone out of print since long. It is gratifying to note that we have received an appreciable financial assistance from the Ministry of Education and Culture, Department of Education, Government of India, as well as from the State Government of Maharashtra. But for the financial and received from both the Governments, the publication of this volume might not have materialised. We record here our deep sense of gratitude to both the Governments for their generous and timely help. Similarly, Shriman M. S. Parkhe of the Central Pulp Ltd., Fort Songad, relieved us from the anxiety of paucity of paper, by specially manufacturing the adequate quantity of durable printing paper required for this volume and we feel grateful to him for the same. The printing of this volume was carried out by Shri. 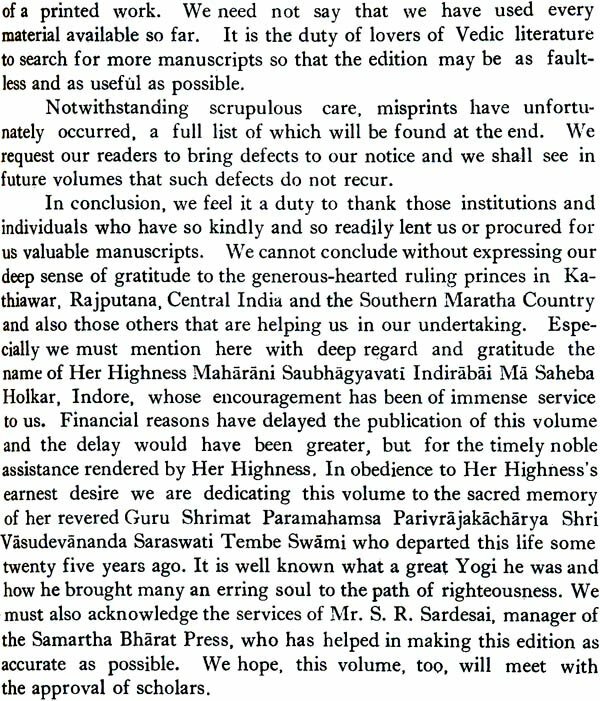 S. P. Barve of the Parashuram Process, Poona 5, and we thank him very much for the great vigilance and care he applied to the printing of this volume. We feel great pleasure in presenting this fourth and the last volume of Sàyana’s commentary on the Rgveda to the world of scholars. We also feel a sense of satisfaction at the completion of the enormous task undertaken by the Vaidika Samsodhana Mandala, although the fifth volume comprising various indices is yet to be prepared and published. A General Review of the Work:—The Vaidika Samsodhana Mandala was founded in 1928 under the auspices of the Tilak Maharashtra Vidyapith, Poona, with the aim of reviving and encouraging the study of Vedic literature. 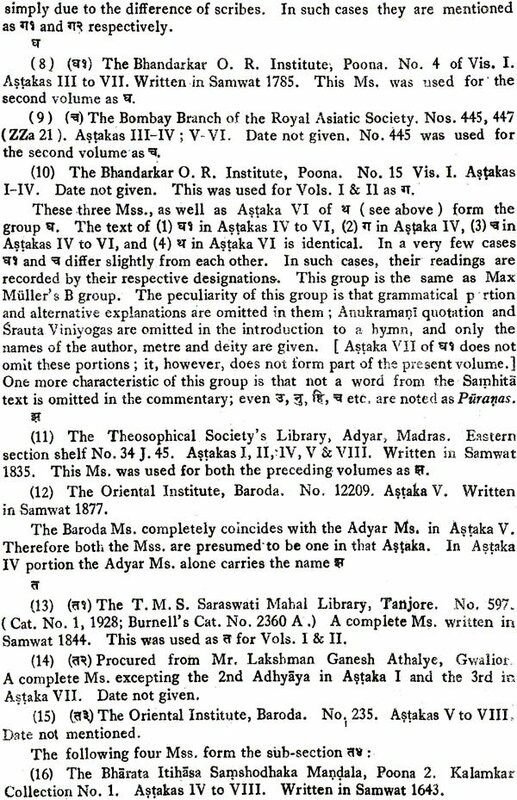 An edition of Sayana’s commentary on the Rgveda was not then available in the market, Both the second edition of Max Muller and the Bombay edition were practically out of stock and it was considered that a critical edition of Sãyax3a’s commentary on the Rgveda based on unused old MSS. was the first thing to commence with. A scheme of the publication was immediately prepared and brought into operation. The first volume comprising Mandala I was published in 1933, the second containing Mandalas II to V was sent out in 1936, the third giving Mandalas VI to VIII was published in 1941 and the present one containing Maça1as IX—X is being published in 1946. Max Muller’s editio princeps required 25 years for completion. His second edition was published within a short period of two years so also the Bombay edition seems to have been published within a period of two or three years. The reason why our edition took a longer period for completion as compared with the two editions just mentioned, is that the duration required for the completion of our edition includes the periods both of editing and printing, while those editions were probably ready before they were actually sent to press. It should also be remembered that such huge literary projects have to be backed by adequate financial support for being brought to a successful completion within a specific period. The first edition of Max Muller was published under the patronage of the East India Company, and for the second edition the generous patronage of H. H. the Maharaja of Vijayanagaram had become available. For the editors of the Bombay edition the support of a sound publishing firm was probably sufficient in view of the manner in which they worked. For us, no support of any of these kinds was available. The circumstances which led to the foundation of our Mandala were such that no Government patronage could be expected. We had to carry on our activities entirely on the sympathy of the general public. There is no doubt much truth in what Prof. Macdonell says about the impropriety of editing texts in fasciculi. (Cf. Introduction to Bhaddevata p. xxxiv). But it does not equally apply to such extensive texts as Sayana’s commentary on the Rgveda, especially when critical editions of the same have already appeared. When we commenced editing the first volume, we were new entrants in the field. Each volume gave us more experience by which we were profited at the time of editing the next one. Had it been possible to complete the editing of all the volumes before any one was sent to press, the classification would have obviously been more uniform. It will be, however, seen that even in the first volume all available variants have been recorded in the foot-notes, though no attempt could then be made in the matter of classification of MSS. Such attempt has, of course, been made in the second and third volumes. We have great pleasure in bringing out the fifth volume of the Rgveda comprising the various indices. Really speaking the edition of Rgveda with Sayanabhasya was completed by the fourth volume comprising Mandalas IX and X with Sayanabhasya which was published in 1946. Since, how- ever, no edition can be said to be complete without the requisite indices so inevitable for a scientific study of the text concerned, the edition may aptly be said to be complete with this fifth volume. The publication of this volume was planned since the very beginning and it has been eagerly awaited by scholars. 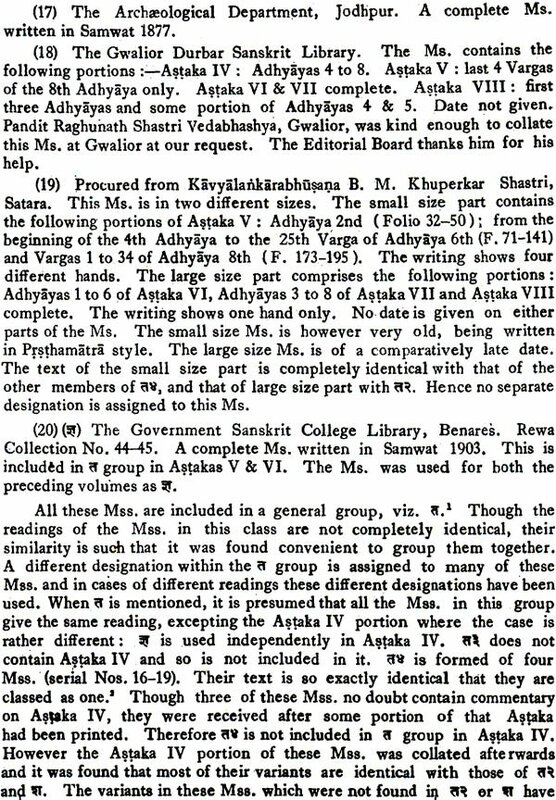 The demand was greater also on account of the fact that the indices were not available to scholars except those who possessed Prof. Max Muller’s edition of Rgveda with Sayana’s commentary. 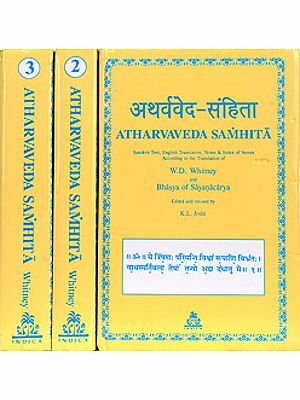 The Bombay edition of the Rgveda with Sayanabhasya gave only the mantra- index. 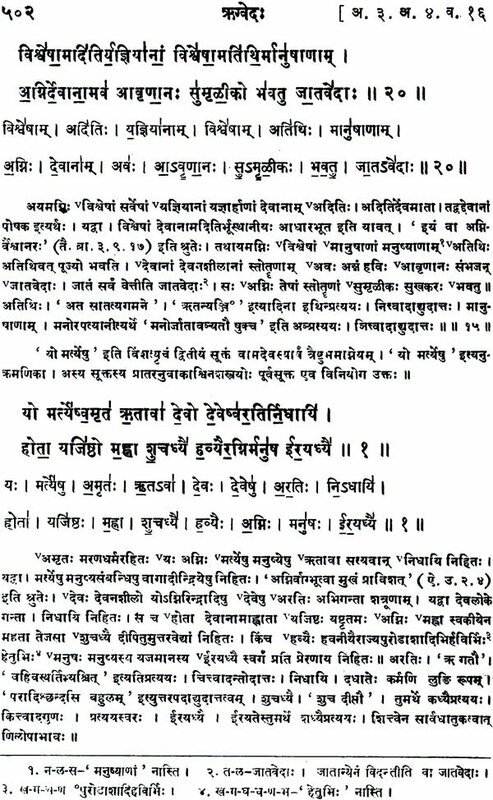 A Devanagari reprint of Max Muller’s Word-index of the Rgveda was published by Swami Vishveshwarananda and Swami Nityananda. But it is also long out of print. The Vishveshwarananda Vedic Research Institute of Hoshiarpur, Punjab, has already planned the publication of a number of volumes giving word-indices of the entire Vedic literature and has even published a few volumes amongst which there is one (vol. I, part I) that gives a word-index of all the Samhitas. But it covers words beginning only with Y. Further volumes are still to be published. Under these circumstances the publication of this volume may, in our opinion, be considered as not only justified but essential. The first volume of our edition was published in 1933, and now this fifth and last volume is being out in 1951, thus completing the edition in about a period of 18 years. The reasons for this length of period required for completing the edition in comparison with the other editions have already been discussed in the introduction to our fourth volume. On this I occasion we feel it our pleasant duty to express our gratitude to the Almighty-the Vedapurusa for favouring us with the complete publication of the Rgveda-His nissvasita, along with the materials necessary for its understanding. As already said, the index-material is absolutely necessary for the scientific edition of any text and has to be collected and compiled before commencing the editing. For the purpose of our Rgveda edition, how- ever, the indices prepared and published by Max Muller were already available. Hence the preparation of the word-index and other indices was not undertaken by us before editing the first volume, but was commenced after the fourth and last volume of the text and commentary was out. 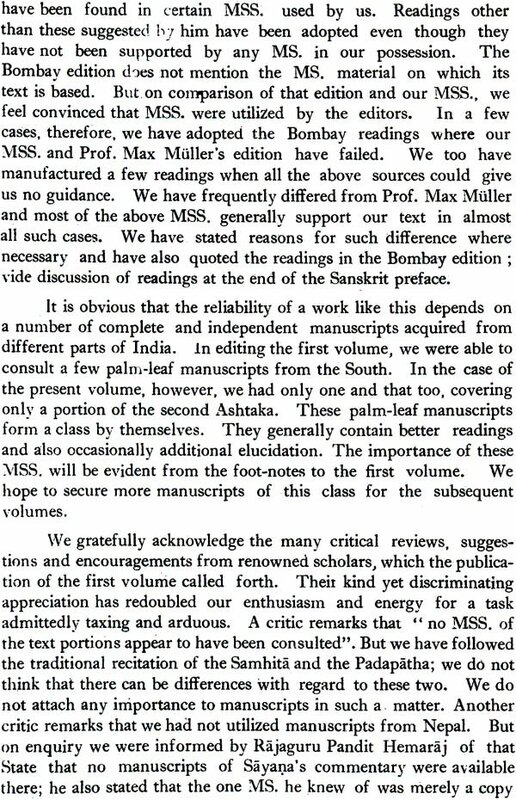 Naturally, for compiling the present volume, the indices published by Max Muller have been of immense help to us. We, therefore, gratefully express our indebtedness to him. The plan of this index-volume has been practically the same as that of Prof. Max Muller. His index-volume comprised the Sarvanukrama, index of Devatas, index of Reis, index of Pratikas, word index and Uttarapadasuki. All these are included in the present volume also. We have commenced the volume with the word-index only because it was prepared first of all. 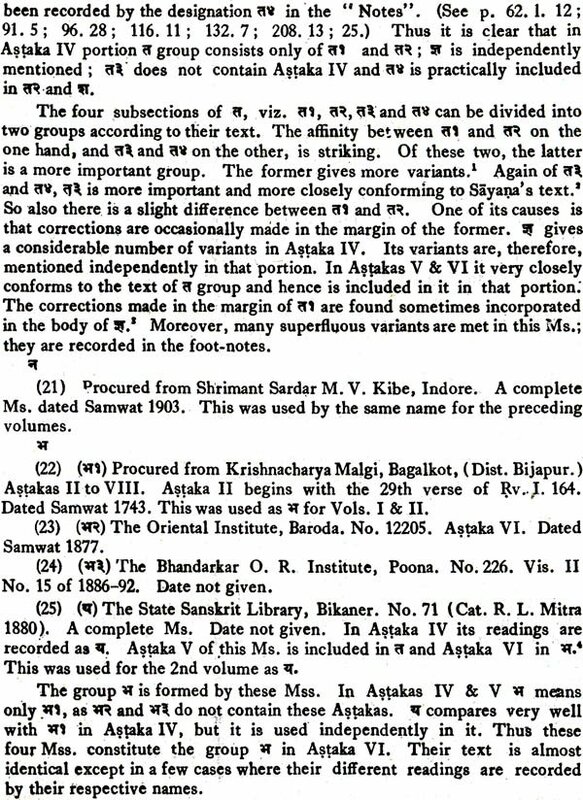 ,In addition to these, we have published the index of metres as is given at the end of the edition of Katyayana’s Sarvanukrama edited by Prof. A. A. Macdonell. Besides, a word-index and a verse-index of the Khilas have also been incorporated here. The word-index of the Khilas is being published here for the first time. The verse-index of the same was first published by Dr. Scheftelowitz at the end of his Apokryphen des Rgveda. It had been suggested to us to include some other indices also in this volume. For instance, some scholars proposed that we should publish an index of names of historical persons in the Rgveda and another of geographical names. But it was thought that the preparation of such indices would involve the interpretation of the Rgveda regarding which there is no unanimity amongst scholars. The last word with regard to the interpretation of the Rgveda has not yet been spoken. Until that any attempt to prepare such an index is bound to prove. to be imperfect. It was reasonable, in our opinion, to publish only such indices regarding which there cannot be any point of dispute. 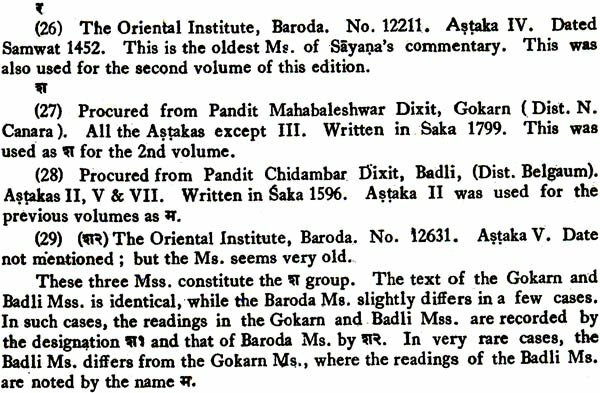 Another suggestion made was to publish lists, of passages or sutras quoted from different works in Sayanabhasya, such as Panini’s grammar, Yaska’s Nirukta, Saunaka’s BrhadDevata, Asvalayana Srauta—sutra and the various Brahmanas. This, in our opinion, would involve much labour and additional expense without any material gain. In his commentary on the first Mandala, Siyana has made a comprehensive attempt at explaining each and every word occurring in the Rgveda on the basis of Panini’s grammar and has, therefore, quoted the various sutras often and often. Further he has left that practice considering that the elucidation made in the commentary on the first Mandala covered practically everything. The same thing applies to other works also. Therefore, it did not matter much if a particular Sutra of Panini was found quoted in the commentary on a particular mantra. With regard to the indices found in common with those in Max Muller it has to be noted at the outset that the indices printed in this volume are not a mere reprint of Max Muller. Each and every index has been in-A dependently worked out “The opportunity of comparing the index thus prepared with that of Max Muller has, of course, never been lost. Of all the indices the word-index is the most extensive and also the most important. The pada as read in Pada patha has been taken as basis, just as Max Muller has done. A comparison of our word-index with that of Max Muller revealed that his index suffered from three types of imperfections: (1) Repetitions' in the Rgveda-padapatha are not recorded therein. The number of words omitted in this way is not small. This defect is probably due to the fact that his index was based either on some MS of Rgveda-padapatha which also must have omitted the repetitions. There is evidently no reason in not recording a pada because it was omitted in traditional recitation of the Padapatha. (2) There are some omissions of words due to oversight. (3) In some cases either the reading or the accent is printed incorrectly. 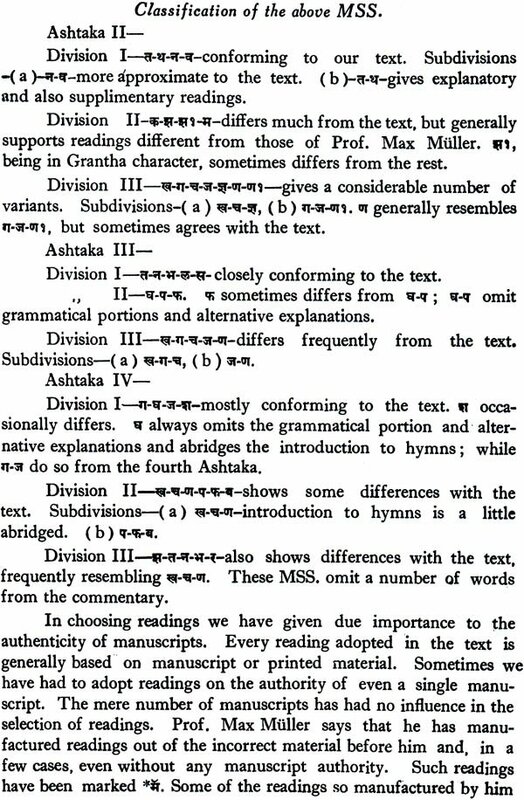 It is possible to collect all such irregularities in Max Muller’s word-index, but it has not been thought expedient to do so here. A word by way of explanation is necessary as to why it was chosen to print a separate word-index for the Khilas instead of incorporating the same into the main word-index. There are certain reasons for doing so. The first is that just as the words from the main text are referred to by means of three figures denoting mandala, sukta and mantra respectively; similarly the Khila-words are referred to by three figures denoting the adhyaya, sukta and mantra respectively. So it would have been necessary to attach some sign to them for distinguishing them from the ordinary words. Then there are certain hymns and verses which, being apocryphal, are kept outside the fold of the five adhyayas of the Khilas. However, they have got some sort of tradition behind them and hence claim a place along with the others. It would have been necessary to distinguish words in them from those in the Khilas proper which means another complication. It would have been a disservice to the reader, had the words from the khilas as well as from the apocryphal hymns and verses been allowed in the index without any sort of distinction. Such provisions would have made the matter rather clumsy. Another very important reason is that the system of accents adopted in printing the Khilas was different from the normal one. There the udatta was shown by a perpendicular stroke above the letter, just like the svarita. It was necessary to follow the same system in printing the Khila word-index. Had the Khila word-index with a different accent system been incorporated into the main index, the whole matter would have become useless. For these reasons it was thought convenient to print a separate word-index for the Khilas. It would be, we think, profitable to use the two indices separately. After the verse-index of the Rgveda about which there is nothing worth special mention, there is the verse-index of the Khilas. The references are to chapter, hymn and verse. In the case of apocryphal or unauthorised hymns and verses the page-number is shown in brackets. 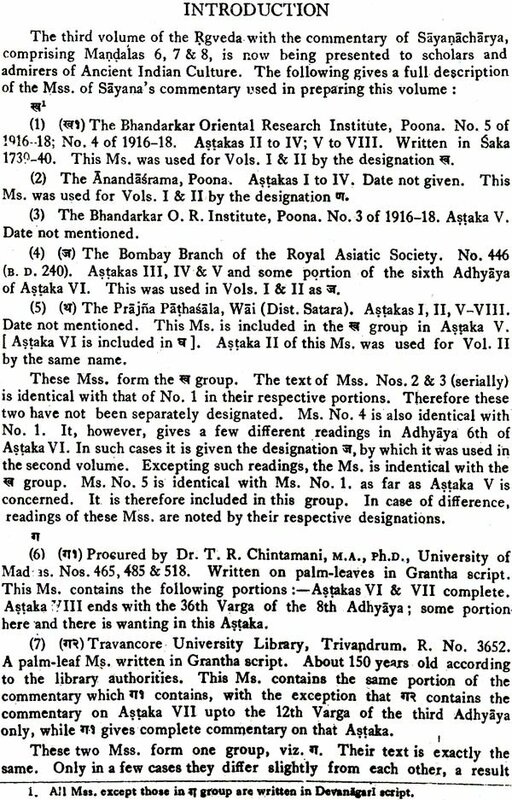 In compiling the index of Rsis the Sarvanukrama of Katyayana has always been consulted. 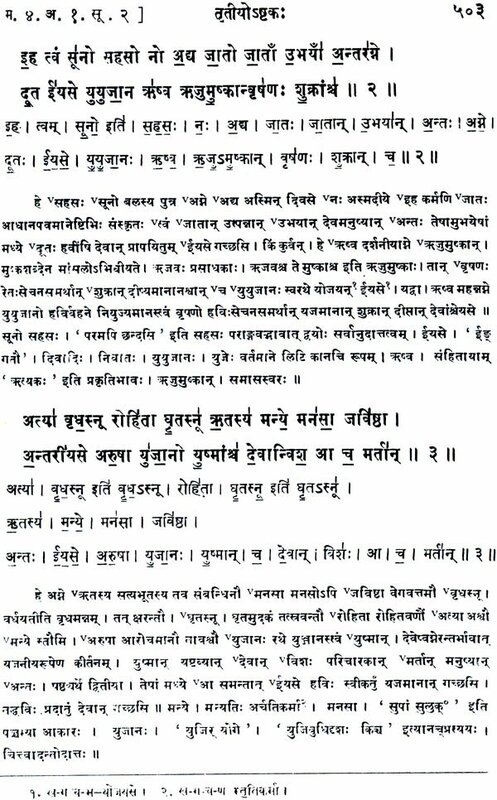 For compiling the index of Devatas both the Sarvanukrama and Brhaddevata have been consulted and the Devatas differently recorded in the Brhaddevata have been noted in foot-notes. 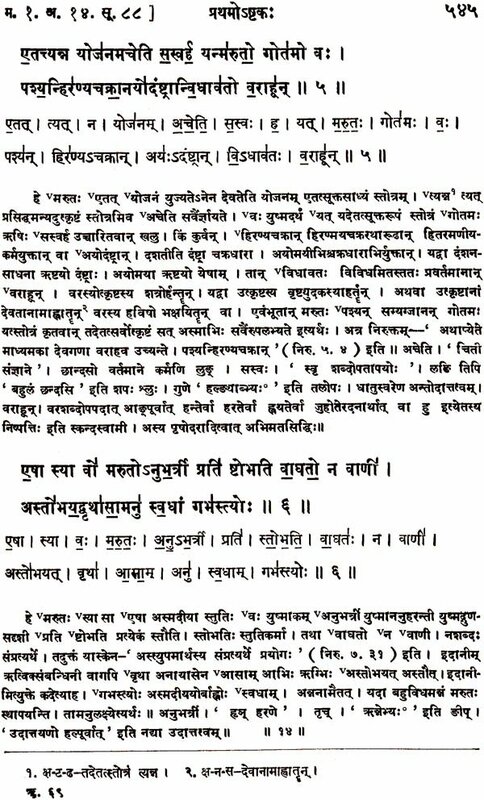 For this purpose the index of Devatas printed in MacDonnell’s well known edition of Brhaddevata has also been used. One thing may be mentioned with regard to the entry of Devatas. There are certain hymns or verses which are treated in Sarvanukrama as atmastuti. In some of these cases (3.26. 7-8; 4.26. 1-3; 42. 1-6; 10.119) Max Muller has recorded atma or paramatma as the deity of the hymn or verse. That he meant soul by the word atma is clear from his entry as "Brahma, see atma ". In fact in such verses the Rsi of the verse concerned praises himself, not atman in the Vedantic sense. So we have given under the word atma cross-references to many of these Rsis and have given the actual references. Under the respective names of the Rsis themselves. 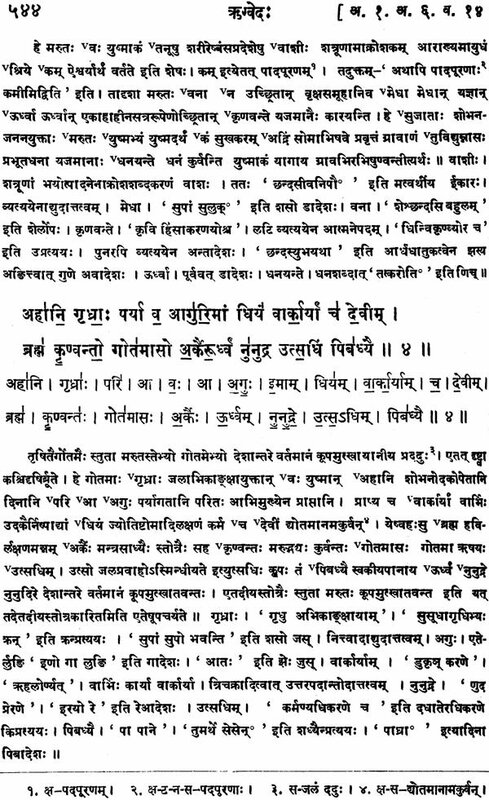 After the Devata-index comes the index of metres for which Macdonell’s index added to the edition of Sarvanukrama has mostly been used. We acknowledge with thanks the help we received from the two monumental works of Prof. Macdonell, viz. Sarvanukrama and Brhaddevata. Lastly comes the Sarvanukrama in which references according to the Mandala enumeration and Astaka enumeration, pratika of the hymn, number of verses in each hymn, Rsi, Devata, Cchandas and page-reference are given in tabular form. Some explanation is necessary with regard to the figures placed both above the words as well as above the mantra-number in a reference, since they are used in different senses at different places. First of all, in the word-index it comes only at the top of the mantra-number and denotes the repetitions of the word concerned in that particular mantra. In the word-index of Khilas it occurs both above the word as well as the mantra- number. The figure above the word refers to the foot-note and the figure above the mantra-number denotes the repetitions of the word in that mantra as in the word-index. In the index of Khila verses it occurs above a word and refers to the foot-note. In the index of Devatas it comes both above a word as well as above a mantra-number. The number above a word refers to the foot-note and that on a mantra number denotes the pada of the mantra, sometimes even a half-verse. In the index of metres the number placed upon the mantra-number refers to the foot-note. In the Sarvanukrama given in tabular form a number is shown above the mantra- number in the column for deity and it denotes the pada of that mantra, sometimes even a half-verse. In spite of all possible care, a few mistakes have crept in the present volume. ‘These are recorded below the contents. The reader is requested to refer to them and make corrections accordingly before using me book. There may be a few other minor mistakes, but they are easily comprehensible. We have been compelled to enhance the price of this volume as compared to the previous volumes. When we published the fourth volume, me second world-war was just over; however, there was no improvement in the worse conditions already created. We then naturally expected that conditions will definitely ease by the time of the publication of the fifth volume. To our misfortune, however, the conditions not only did not ease but became still more difficult. In conformity with the very high prices in the market, the cost of printing rose considerably. An increase in the price, therefore, became inevitable for which we crave the indulgence of the reader. The extent of the volume is also partly responsible for the higher cost. ACKNOWLEDGMENTS :- We have now to do the pleasant duty of acknowledging help that has been given to us in bringing out this volume. First of all, we have to express our deep sense of gratitude to the Government of Bombay for their deep sympathies for this work. Besides the annual recurring grant, the Government were pleased to sanction a non-recurring grant of Rs. 10,000 towards the publication. of the present volume. The expenditure made one paper for this volume was fully met from this grant. We have also to express our gratitude to the Government of India, Government of Hyderabad, Government of Nepal, and the Governments of Uttar Pradesh, Bihar and Saurashtra for the liberal patronage given by them. Formerly we used to seek the patronage of Indian Princes who, we are proud to say, rose to the occasion and did what ever they could to help use financially; Since the attainment of Independence of India almost all the States have been merged with their neighbouring provinces. Naturally the moral responsibility to patronize such causes which ultimately lead to the cultural resuscitation of modern India now lies with the Government of India and State Governments and we are glad to say that they are bearing it commendably. We are confident that efforts of this kind will be liberally patronized also in future. We have also to thank the Akhila Bharatiya Arya (Hindu) Dharma Seva Sangh, Delhi and its president Shriman Seth Jugal Kishore Birla under whose direction the Sang he has been liberally helping our Mandala for the last few years. We are thankful to all our donors rand sympathizers abut for whose help it would not have been possible to undertake and continue the work on the various projects. To scholars and oriental journals we are thankful for their appreciation of the four volumes of our Rgveda edition already published. Our thanks are also due to the management of Messrs. Killick Nixon & Co. (The Indian Paper Sales Association), Bombay, for promptly procuring suitable paper for this volume. Last, but not the least, we must thank Mr. S. R. Sardesai, B.A., LLB., Manager, Samarth Bharat Press, Poona, for the efficient and speedy printing- of the present volume. It may be noted with pleasure that all the live volumes of our edition were printed at this press and we take this opportunity to express our appreciation for the hearty co-operation rendered by its staff all these years. Now that the project of the publication of the Rgveda edition has fully materialized, we shall be free to devote our energies to the other B projects already announced, viz. the edition of Krsna Yajurveda Taittiriya Samhita and the Srautakosa. May the Almighty who graciously accredited us with the completion of the Rgveda edition also do us the favour of enabling us to go through these undertakings? Lastly we beg to place this volume in the hands of students of the p Veda and hope it will meet with their approval.